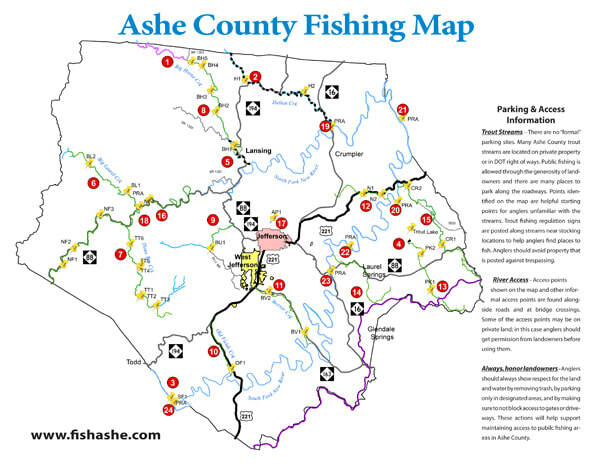 On behalf of Ashe County, I invite you and your fishing buddies to visit beautiful Ashe County, NC located in the majestic Blue Ridge Mountains. 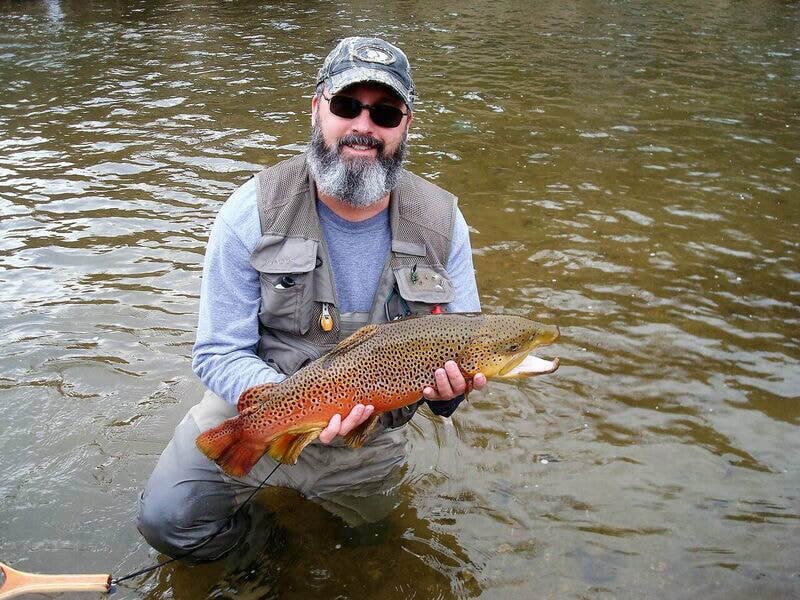 Ashe County offers some of the finest fishing in the U. S. Our streams are stocked with almost 70,000 brook, rainbow and brown trout each year. In the North and South Forks of the New River you will find smallmouth bass, redbreast sunfish and rock bass. 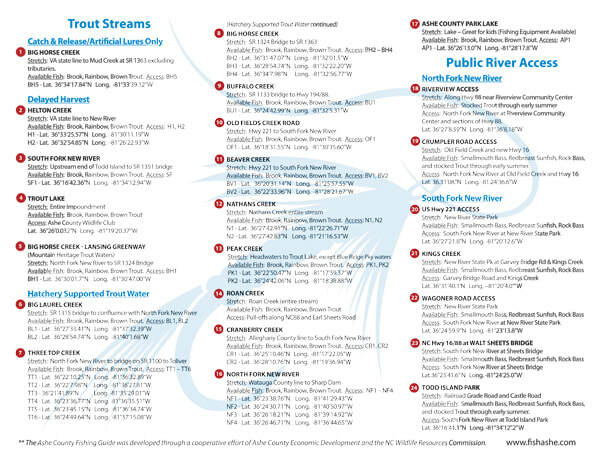 Although there are many fishing locations, the Ashe County Fishing Guide highlights 24 access points (17 trout locations and 7 bass locations). Since most Ashe County trout streams are located on private property or in DOT right of ways, always respect the rights of property owners and leave the streams in better condition than you found them. If you are a member of a fishing club, I encourage you to share this invitation with all your members. To assist in your planning, attached below are a fishing map and coordinates. For a digital version, visit www.fishashe.com. If you would like copies of the printed map, contact Cathy Barr at the address below. ​Football teams have home fields and basketball squads enjoy a home court advantage, so it is only fitting that a fishing group have its own river. But in the case of the Blue Ridge Chapter of Trout Unlimited based in Winston-Salem, its friendly confines are about 40 miles away — where the Ararat River meanders through Mount Airy and lures anglers from around the region. That includes members of the Winston-Salem Trout Unlimited group that was formed about 40 years ago, who have embraced a section of the river in Mount Airy. That not only includes fishing its pristine waters, but holding periodic cleanup events to keep it that way, such as one on Nov. 19. “We just kind of took it under our wing,” chapter President Roy Davidson explained of how the group adopted the Ararat as its home stream. “It was the closest trout stream to Winston-Salem, and we thought that was a good opportunity for us,” Davidson, a retiree who is a lifelong fisherman, added regarding the Blue Ridge Trout Unlimited efforts to care for the local waterway. It also is appealing to escape a big city by coming to Mount Airy. “Well, it’s kind of like our hometown — many of us love visiting Mount Airy,” Davidson said, praising its warmth and friendliness to out-of-town anglers who also patronize restaurants and stores while here. “We have right at 400 members, all within the Winston-Salem area,” he said of the Blue Ridge Chapter of Trout Unlimited. About 60 of those are considered active members, who take part in events such as the Ararat River cleanups. Davidson said one catalyst for the Winston-Salem group’s embracing of the local river was a streambank restoration project within the past 10 years. It repaired decades of erosion and improved its overall capability to support the fish population. This led the Ararat to once again be classified as a delayed-harvest stream by the N.C. Wildlife Resources Commission and its stocking with trout. Under the delayed-harvest program, selected trout streams are heavily stocked during the cooler months, but there is a “catch” in that actual harvest of the trout is postponed until the warmer periods. This includes a catch-and-release system in place from October through the first Saturday in June. “It’s fun to catch those bigger ones,” Davidson said of one effect of that designation. So while there is an admittedly selfish motive for an out-of-town group such as Blue Ridge Trout Unlimited wanting to take care of the Ararat River, there is also a long-range goal of stewardship. This includes a desire to conserve the river “and make it available for our children later on,” Davidson said. That’s where the ongoing cleanups play a role. “We usually do it twice a year, once in the spring and once in the fall,” Davidson said. During the most recent one in late November, members gathered for day-long activities that included removing trash and other items from the river and a picnic at a shelter in Riverside Park. “We actually had 33 people participate in the stream clean that morning, but as the day wore on the weather became quite windy and kind of ruined our picnic, games and fly rod casting tournament we had planned,” Davidson related. Davidson said one regular task with the cleanup surrounds tires that were embedded along the river over the years to reduce erosion. As time passed, tires have become dislodged and found their way into the river, awaiting removal by the cleanup crew. Catrina Alexander, Mount Airy’s parks and recreation director, appreciates how the Winston-Salem-based group “has become such a vital partner for fishing tourism, education and conservation” in the aftermath of the river-restoration project. “We are certainly grateful for the members of BRTU,” Alexander added. Tom Joyce may be reached at 336-415-4693 or on Twitter @Me_Reporter. I'm writing you because you probably fish the Smith River in Virginia. The Smith has a lot of challenges. It is a 30 mile trout tailwater that has existed for over 60 years. This is Henry County's only stocked trout water and has been managed by the state from the onset. Currently, decisions are being made concerning generation on the Smith. Decisions concerning the waterway affect us all and public input is critical to ensuring our natural resources and outdoor recreational assets are protected. If you will notice the list of stakeholders involved in the 2015 discussions did not include any representatives of the fishing community or the state's fish and game (VDGIF) biologists. Nor did they consider the negative economic impact of the loss of anglers. They do mention the flows will provide cold water that will benefit the fishery downstream. We and VDGIF have been asking for a 1-2 hour pulse of cold water on summer Sundays for 10-15 years and have always been told that was impossible. Now we get releases for 4 hours in the middle of the day, both weekend days, in every month? It is the biologists' contention that the fall, winter and spring releases are detrimental to the fishery as well as the length of the proposed summer releases. Many of us are paddlers, too. We think the best solution is a compromise that benefits all, including the high-value tailwater fishery..
As you may know, the powerhouse suffered a serious fire earlier this year and regular generation has not yet resumed. When repairs are complete, we need to do everything in our power to ensure the weekend releases do not resume as they were before. To see one day of generation, preferably Sunday. To see it reduced to 3 hours. To see it for June - September only. To have a fishing representative and VDGIF included in all flow-related discussions. Please add a personal touch to the letter. We will pool these letters and share them with appropriate stakeholders and decision-makers. Whirling disease, a disorder affecting trout, has been confirmed in rainbow trout collected from Watauga River near Foscoe in Watauga County — the first occurrence of the disease in North Carolina. Whirling disease affects fish in the trout and salmon family with rainbow and brook trout, two species found in North Carolina waters, being the most susceptible. The disease, caused by the microscopic parasite Myxobolus cerebralis, damages cartilage and skeletal tissue in a fish, causing it to swim in a whirling motion. While often fatal to juvenile fish, the disease does not infect humans or pets, and eating an infected fish is not known to cause any harmful effects. The parasite that causes whirling disease was first discovered in Pennsylvania in 1956. Since then, whirling disease has been confirmed in other states, with varying degrees of severity. In some states, whirling disease has been observed in isolated cases and has had little impact while in other states, such as Montana and Colorado, the impacts on trout populations have been more pronounced. Although the infected trout were collected from a section of the Watauga River well upstream of public trout stocking locations, the N.C. Wildlife Resources Commission has proactively suspended stocking fish raised at its three trout hatcheries until it can confirm that hatchery trout are free of the disease. As one of many precautionary measures, staff is collecting fish from Commission trout hatcheries and sending them to the Fish Disease Laboratory at Auburn University for testing. Commission staff will also collect trout from the Watauga River and tributary streams to test for whirling disease and to determine its distribution in the watershed. In addition, Commission staff is working closely with N.C. Department of Agriculture and Consumer Services and N.C. State University to sample commercial aquaculture operations in the area where the infected trout were found. The Commission encourages the public to help prevent the spread of the parasite that causes whirling disease by cleaning and drying equipment, clothing, or anything else that comes into contact with water. In addition, no one should move live fish or aquatic wildlife from one body of water to another without first obtaining a permit from the Commission. Anglers are asked to contact the Commission if they observe deformities, strange swimming behaviors, or other signs of disease in trout. For a list of frequently asked questions on whirling disease, to learn more about whirling disease and its effects on trout, and to report signs of disease in trout visit the Commission’s dedicated webpage, www.ncwildlife.org/whirlingdisease. The page will be updated as test results become available. The Commission also will post information on its Facebook page, Twitter page and eNewsletter, N.C. Wildlife Update. Elk Creek (DH)... Help not needed. Went to Elk Creek today to help with stocking the Delayed Harvest section only when the truck got to where I was there was already 3 guys on it. They didn't need any more help. So, I helped myself to catching what they were putting in the creek. I had a head start before the stocking truck got there but, it was a 50 fish day! Girdle bug, Barr Emerger, Rainbow Warrior and even got a few on a Parachute Adams. Helped stock the Ararat in Mt Airy yesterday. I was on the truck scooping them out. There are some amazingly large Browns in the river now along with quite a few Brookie's. Caught a few after we finished stocking. Go catch your "Prize" this weekend! Rainbow Warriors were working for me. A fellow member told me black Buggers were working for him. Have corrections, additions or updates? Send a request to the BRTU web administrator by clicking here. © COPYRIGHT 2019 Blue Ridge Trout Unlimited of Winston-Salem, NC. ALL RIGHTS RESERVED.